The annual Dance Forum brings together a wide variety of individuals working in the dance industry to connect with peers and discuss immediate, field-wide issues. 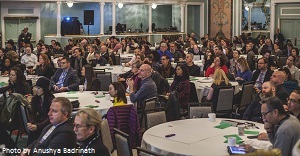 The 2016 Dance Forum was presented in a workshop-style convening with plenty of opportunity to dialogue with peers from across the country and internationally. This event included the voice of the artist, dance company manager, agent, presenter, service organization, and more. The morning was a dynamic combination of large and small group conversations and networking opportunities. We explored how we can pro-actively increase performance opportunities through the relationships between multiple stakeholders that make performance opportunities possible. These relationships were presented in small panels, or snapshots, before breaking into group discussions. During the Dance Forum, Dance/USA gave updates on upcoming programs, new research initiatives, membership, and more. There was coffee and time to network with dance industry colleagues throughout the Forum. Before the Dance Forum began, we were joined by Metris Arts Consulting and New England Foundation for the Arts (NEFA) for a share out of preliminary findings from research on the National Dance Project's retrospective and field scan. This session included interactive opportunities for the field to “ground-truth” the preliminary findings and shape the final research. This session and the Dance Forum were free and open to the dance community; APAP registration was not required. Read Dance Forum Speaker Biographies! 7:30am | Coffee service begins in the Trianon Ballroom. 8:45am | Grab a cup of coffee in the Trianon Ballroom before the Forum begins! We will take time to frame the dialogue around the upcoming snapshots. Features a relationship between a presenter, artist, and service organization. Features dance artists who have robust upcoming touring schedules. Coffee service will be provided in the ballroom. Features a relationship between an agent, presenter, and artist. Features a dance company partnering with an educational institution. The 2016 Dance Forum took place at the Association of Performing Arts Presenters Conference on Friday, January 15, 2016 from 9am- 12noon at the New York Hilton Midtown.